Many of you probably know Barbara of the wonderful Winos and Foodies. If so, then you know that for the last two years, she has hosted A Taste of Yellow, a food blogging event featuring yellow foods, to celebrate her survival of cancer and to raise awareness of the Lance Armstrong Foundation. Sadly Barbara's cancer has returned, and she is currently undergoing another round of chemotherapy. Her dear friends, Bron of Bron Marshall and Ilva of Lucullian Delights, have organized a secret blog event in Barbara's honor so that we might all give her a "big virtual hug," and post some recipes that she might find enjoyable right now. 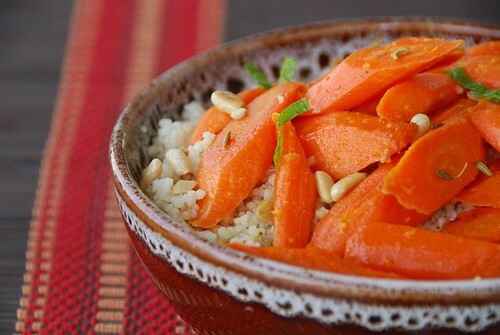 Barbara has been craving fresh Asian and Moroccan flavors, so I created this Moroccan Carrots and Couscous dish for her. Carrots are powerhouses of beta carotene, an antioxidant that may lower your risk of cancer, as well as lutein, which promotes ocular health. The dish also contains ginger, mint, and fennel seeds, all proven to help alleviate nausea. Since I created this dish with Barbara in mind, I avoided sweet flavors and kept things salty and savory. However, if you'd like, you could toss in some golden raisins or drizzle the servings with some honey. After it rained the other morning, a glorious rainbow briefly filled the sky. 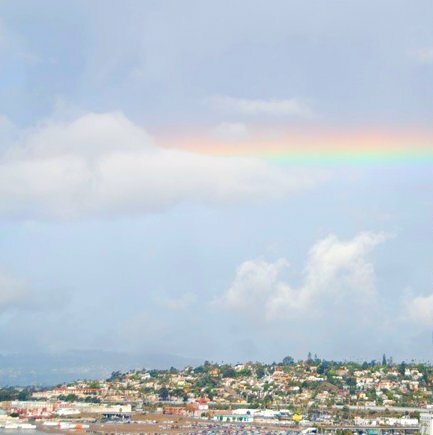 A symbol of peace, hope, and safe travels, a rainbow seems just right to send Barbara's way. Place sliced carrots in a large bowl. In a small bowl, whisk 2 teaspoons olive oil, cayenne pepper, and salt; pour over carrots and toss until coated. Place carrots in a single layer on a baking sheet. Cook uncovered for 15-20 minutes, or until carrots are tender yet crisp and have a few brown spots. In a small bowl, whisk lemon juice, lemon zest, olive oil, and ginger; set aside. In a small dry skillet over medium, toast fennel seeds and pine nuts for 1-2 minutes, or until lightly golden and aromatic; set aside. Place couscous and water in a microwavable bowl; cook on high for 1 minute. Rest on counter top for 5 minutes, then fluff with a fork. Stir in toasted fennel seeds and pine nuts, and season with salt. Stir in mint. 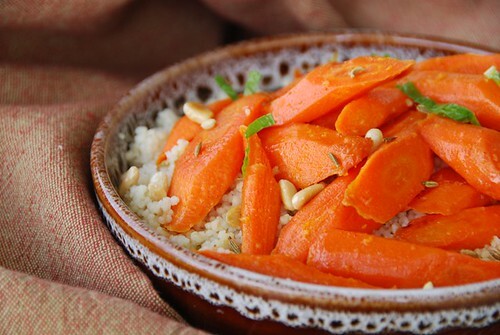 Place couscous in a serving bowl, top with roasted carrots, and drizzle with the lemon-olive oil dressing. Season to taste with salt, and garnish with additional mint, if desired. I'm sorry to hear her cancer returned. Insert hug here. The rainbow looks pretty. How thoughtful, pretty and scrumptious looking! A rainbow and this mouthwatering dish seem perfect send Barbara's way. The hug is growing to epic proportions!! A beautiful post for brave Barbara...& with a delicious dish Susan. The rainbow fits in just perfectly too!! The pic and shot has 'ethnicity' written all over....a beautiful one for a great cause....! Thanks Susan for participating! Lovely dish! Oh, sad news, but a spritely offering. Cous cous, fennel, pine nuts? Mmmmmmmm! That's a very nuce and heathy dish. Lovely message, and loved the rainbow. Susan please come and live with me:) This is perfect. Bryan cooked couscous one night for me and it was not as beautiful as this. It is a fine line between spicy and savoury I am able to enjoy and your couscous looks to be perfectly balanced. Thank you . I hope Barbara gets better soon. This dish looks so flavorful and healthy. I'm sure she would love to eat this. Lovely! I can taste the "feel good" thoughts in this dish! Sorry to hear this news. Your carrot salad is definitely a winner and it's a lovely contribution Susan. Perfect! I can feel the *hugs* that go with this beautiful dish! Lovely dish and rainbow photo, Susan. A lovely dish for a very lovely person indeed! Those carrots jump right off the page. This looks delicious. A big hug out to Barbara. Tasty creation for Barbara and wonderful photo. I'm sure that Barbara will love this dish - and the rainbow! cory-I was sorry to hear about it too. mark-I hope the virtual hugs will lift her spirits. barbara-I'm so happy to hear that, Barbara. 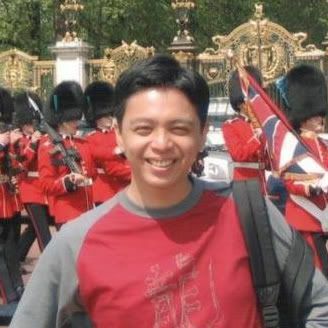 You are in my thoughts, my dear. bron-I was honored to be included. halfbaked-She's getting a lot of them. heather-I'm glad you like it. cakelaw-I hope it makes her smile. A beautiful and thoughtfully constructed dish. Here's hoping that Barbara's health returns. I know good thoughts and virtual hugs like this are powerful medicine. You know what I have been imagining from this secret blog event? It's just like we are forming a big circle, holding hands, giving our positive energy to Barbara, while she's sitting in the middle, receiving this energy hoping it will bring her back to normal life. That rainbow is a good sign, indeed! Wow, what a beautiful rainbow photo! And the carrots and rice sound so healthy and delicious. This is a wonderful dish I can imagine Barbara enjoying! I would enjoy it too! :) Great hug Susan! A gorgeous dish! I can't imagine anyone seeing it and not smiling. What a terrific hug you sent to Barbara. julie-Thank you for the thoughtful comment. arfi-That is a beautiful image. wanm-Rainbows are just so lovely. jenyu-That is awfully kind of you to say. This looks very tasty, something I would enjoy very much. The rainbow is beautiful and a fitting photo, too. Lovely post.